Education”! The Academic Journey continues! We are happy to announce the start of online registrations for RACE 2019. "RACE" was envisaged as a program for postgraduates and over years, we have modified it according to the needs of time. 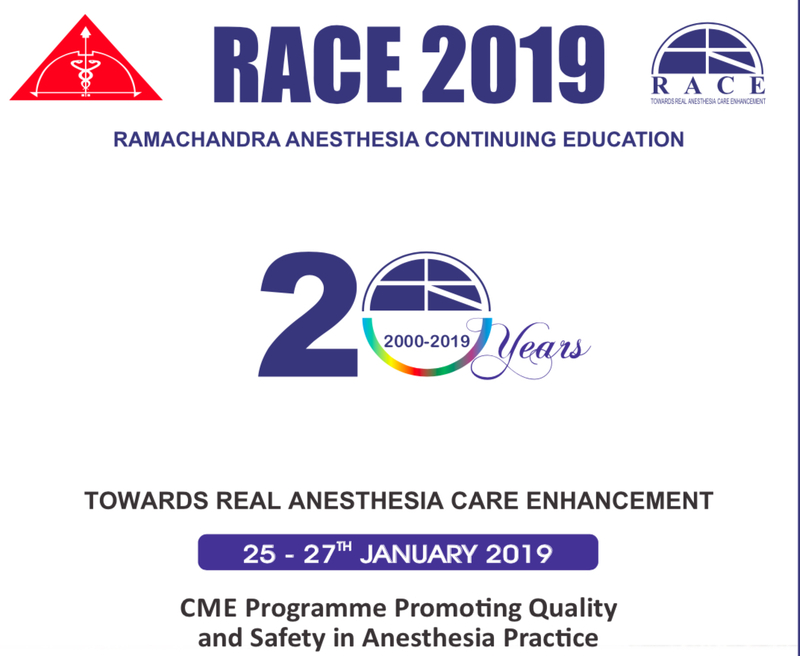 This serves as an excellent platform for the enthusiastic young anesthesiologists to meet experienced, seasoned veterans in the field. In addition to the lectures, we have had Prof. Vijayalakshmi Kamat Oration, Multimedia Quiz, Paper presentations, Video sessions, workshops , case discussions etc. Welcome again to #RACE2019. KINDLY CHECK YOUR NAME AND ADDRESS IN THE PROFILE AS IT IS IMPORTANT FOR CERTIFICATION. NAME IN THE CERTIFICATE WILL BE AS REGISTERED IN THE WEBSITE. Welcome! Online registrations for RACE 2019 are closed. All accommodation requests till 19-12-2018 are confirmed. Accommodations are closed from 20-12-2018. The waitlisted delegates are requested to give us time till January 1 2019 for confirmation/cancellation.Thank you for your continued interest and co-operation for RACE 2019.KINDLY CHECK YOUR NAME AND ADDRESS IN THE PROFILE AS IT IS IMPORTANT FOR CERTIFICATION. NAME IN THE CERTIFICATE WILL BE AS REGISTERED IN THE WEBSITE.